EFFECT: As the performer you have a spectator fairly shuffle and cut a deck of cards. 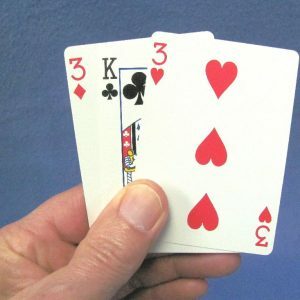 Then from the shuffled deck the cards are separated into two packets of twenty-six cards each. One packet goes to the spectator and the other to you. All of the clubs and diamonds are assembled in one packet, and all of the hearts and spades go into the other. 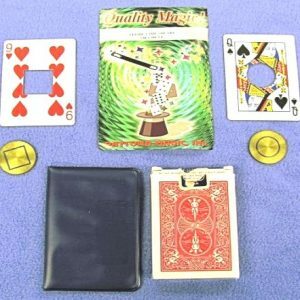 In assembling the cards, however, they are taken just as they occur in the shuffled deck. No attempt is made to rearrange their order. 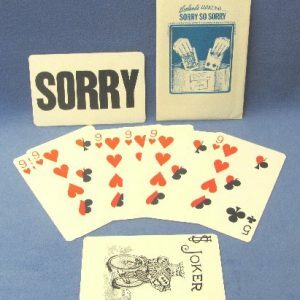 Next, you deliberately deal the cards from your packet, one at a time, face up about the top of the table. On each face up card, the spectator places one of his own cards face down. Thus on each of the twenty-six face up cards scattered about the table top there will be a face down card. 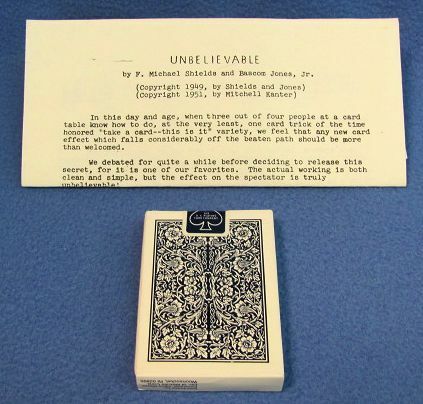 However, you continue, “the odds that all twenty-six cards are matched similarly are astronomical.” But as the spectator continues to turn over the cards, one by one, he finds the “unbelievable” a fact, black deuce is on black two, red nine on red nine, black five on black five, and so on through the twenty-six! Remember that the spectator shuffles and outs the deck, and then consider the stunning impact that the trick must have on him. Combine these two facts with the simplicity of method, and you will begin to get some idea of why we are so fond of the trick.